Many national retailers are adding mobile wallet features in 2019 and so are we! FSB Credit Cards can now be added on Apple & Samsung Pay. Google Pay is coming soon. Debit cards will also be available soon. A mobile wallet is pretty much exactly what it sounds like: a “wallet” that lives on your mobile device instead of in your back pocket. 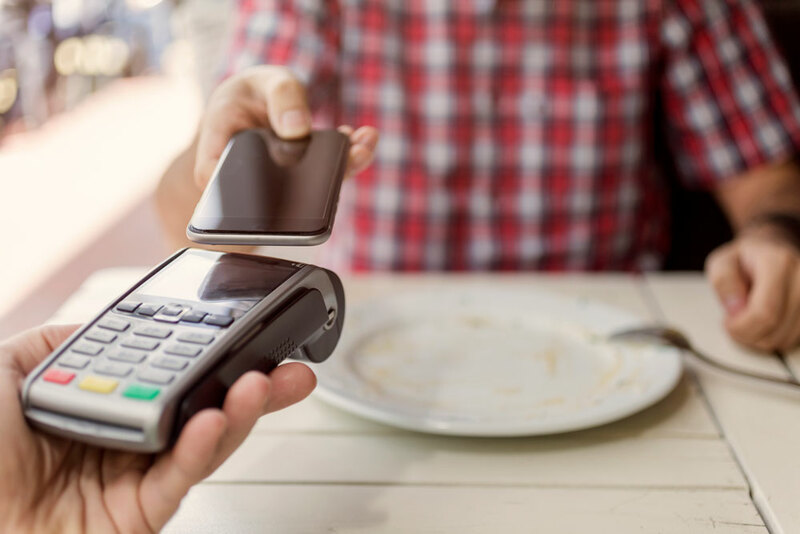 Instead of using your physical plastic card to make purchases, a mobile wallet allows you to pay with your smartphone, tablet, or smartwatch in stores, in apps, or on the web. So, why might you want one? Because it provides a convenient way to pay for goods and services with your smartphone, smartwatch or another compatible device, like a tablet. It can manage all your credit cards, loyalty club memberships and reward cards, and it may help to reduce fraud, too, as mobile wallets are generally harder to steal or copy than physical cards and cash. Why Should I Use A Mobile Wallet? Convenience - leave your bulky wallet full of cards at home. All you need is your phone. Speed - don't wait for someone to count your change or a machine to process your card. Just tap & go. Security - encryption, tokenization,and two-step authentication. Big words that keep your information safe. Read more about security below. How does a mobile wallet work? Start by downloading the wallet app of your choice. Then, load the card information you want to store, from debit & credit cards to loyalty cards and coupons. When you want to make a purchase open your wallet app, choose your card & tap your phone digital payment-enabled terminal at participating merchants. Where can you use your mobile wallet? Many national and large retailers offer updated payment-processing terminals that accept mobile wallets. Samsung Pay, for example, is currently accepted at over 10 million stores in the U.S, while Apple Pay is also accepted at millions of stores. Not only is using a mobile wallet faster and easier than plastic cards, it is also safer than carrying all your cards with you. Two-factor authentication - The biggest security concern is losing your phone or having it stolen. That’s why it’s smart to use a PIN or a fingerprint to unlock your phone. Tokenization - Mobile wallets replace your actual card number with a unique randomized set of numbers (called a token) for each transaction. This means businesses do not see or store your card number. Information that you upload to a mobile wallet gets encrypted, making it harder for hackers to access your information. Transaction protection - Pay confidently from your phone knowing that the same fraud protection your bank gives your credit and debit card carries over your mobile wallet. Which mobile wallet you choose will depend largely on the kind of device you want to use it with. Don’t sweat the choice too much: Many of the popular options are similar in terms of performance and the level of security they offer, so you can choose the wallet that pairs best with your smartphone and use it with confidence. This blog is intended to be an informational resource for readers. The views expressed on this blog are those of the bloggers, and not necessarily those of FSB. This blog does not provide legal, financial, accounting or tax advice. The content on this blog is "as is" and carries no warranties. FSB does not warrant or guarantee the accuracy, reliability, and completeness of the content on this blog.